Before I could even begin to think about planning my daughter’s first birthday party, I came across a whimsical fabric in the remnant bin at my local fabric store and was smitten with the hot air balloon print on it. 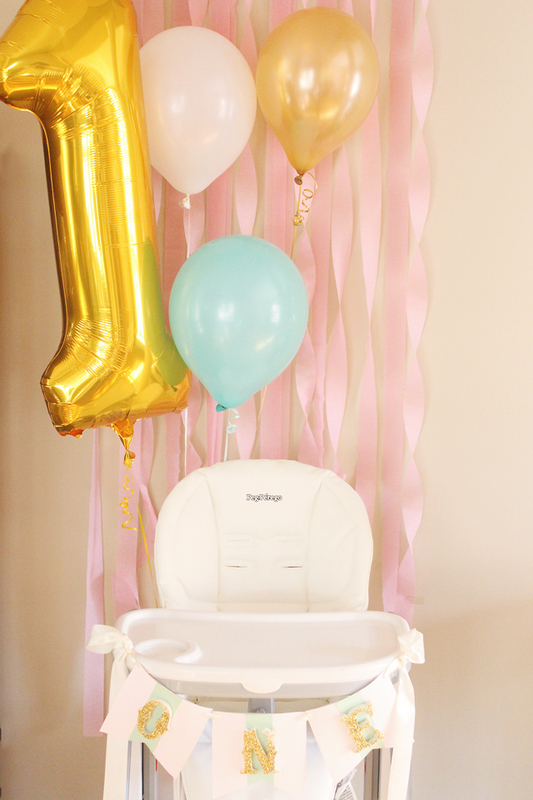 I picked it up and thought that it would be the perfect theme for a first birthday because “Time Flies When You’re Having Fun!” I went with a soft pastel color scheme, with pops of gold and glitter (very similar to her nursery), as these colors just suit her sweet little personality. We also decided that a brunch party would work best for everyone. We served brunch themed food (like chicken and waffles), along with mimosas and coffee for the adults, which was a huge hit! I wanted the dessert table to be the focal point when you walked in and chose to use an oversized 36” balloon, fashioned to a basket to really pull the theme in. The birthday banner is an easy DIY using scrapbook paper, doilies and glitter letters from your local craft store. You can also easily create a DIY tissue tassel garland (can you believe that this entire strand cost only $3 to make?). The apothecary jars and cake stands were also an easy DIY. The cake was exactly what I had dreamed, and I just added the little gold glitter banner. If you are in or around Charlotte, see sources below for information. I found these Martha Stewart fringe lanterns on clearance and thought that they would make perfect hot air balloons. I suspended baskets from them and used fishing wire to attach them to the ceiling. They looked whimsical and fun over the brunch table. The brunch menu consisted of chicken and waffles, homemade biscuits, gluten-free pancakes, fresh fruit and squeeze packs for the babes. I love photos, and having a party really gave me a great excuse to actually print them. I found the Walgreens photo app to be very helpful and was able to use it to print all of my iPhone photos (bottom right), as well as all of my Instagrams (bottom left). I also displayed her monthly photos and milestones (top), which was tough to keep up with, but I am so glad that I have them now to document her first year! At the sign-in table, I had each guest fingerprint his or her thumb onto a sheet of paper to resemble balloons attached to a big basket to serve as a guest book to remember all of her sweet friends who came to celebrate! I also loved the milestone chart that I found on Etsy. You blow me away Mallory! Such a beautiful party for little Landry Kate. 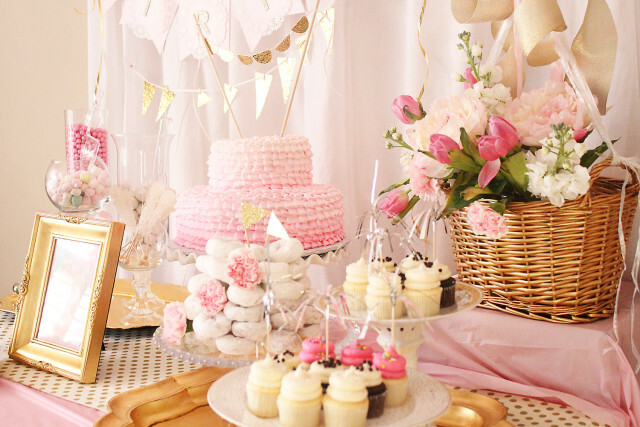 The pink happy birthday display is just a knockout piece – simply beautiful and enchanting and so feelgood – love it! Amazingly beautiful Mallory. All those sweet and feminine touches! Time sure does fly but when you are the guest of honor for a party like this, Landry Kate probably can’t wait to turn 2!! How did you make those adorable invitations! yes how did you do those adorable invitations. i would also like to know how or where to get those invites?? Hi i was wondering how did you do the designs for the milestone photos? Thanks. I want this invitation for my daughter’s first birthday in June! Do you sell the digital copy? ? I am trying to find invites for my daughter’s first birthday, and those are perfect! Is there a way I could get some? Did you buy your mint, peach, and gold latex balloons online and if so where? I know most grocery stores and what not carry balloons, but I live in a small town and don’t have those color options. Thanks! Can I buy a digital copy of the invite? Also wanting to know about the invites! !